So it's the day again, patch day! There has been a lot of fixes and polishing being done this patch, also the new reworked FAC 2.0 has been implemented! We really hope you guys get a better gaming experience every patch, and don't hesitate to post a comment / send a support ticket if you are having any issues with this patch. Fixed an issue with the GC Airdrops where for some weird reason it would still sometimes drop a Killer Skinbox. Fixed an issue related to random airdrops not appearing normally. Fixed an issue related to the airdrops where it would not always come. Fixed an issue where the "right peek fix" for the Tar and L85 and some other weapons wasn't working properly. Fixed an issue related to some item id's missing descriptions in translation packs. This was also spamming in error log. UPDATE: Fixed "the left" peek where players could abuse this with SVD / M107's. UPDATE: Fixed the same for some assault rifles where players could "left peek" with again. Life time premium players / players who have purchased life time premium will get back their 10 load-out slots. Fixed a bug happening to people with poor internet connections that would make their characters stutter occasionally. Fixed a bug causing invalid objects to show on the spawn protection selection menu. Fixed a UI bug causing cosmetics to not display correctly in the home screen. Made some improvements to the spray system. Fixed ping limited servers where some players had issues joining them even though they had a low enough ping. Saving the settings will no longer increase the brightness slightly. Muting a player will also mute the chat for this player. Fixed a texture / model issue with the clan contest points. Improved look overall. Fixed some material settings of some airport props in the new Oregon map. Optimized the new airport terminal building which is used in the new Oregon map. 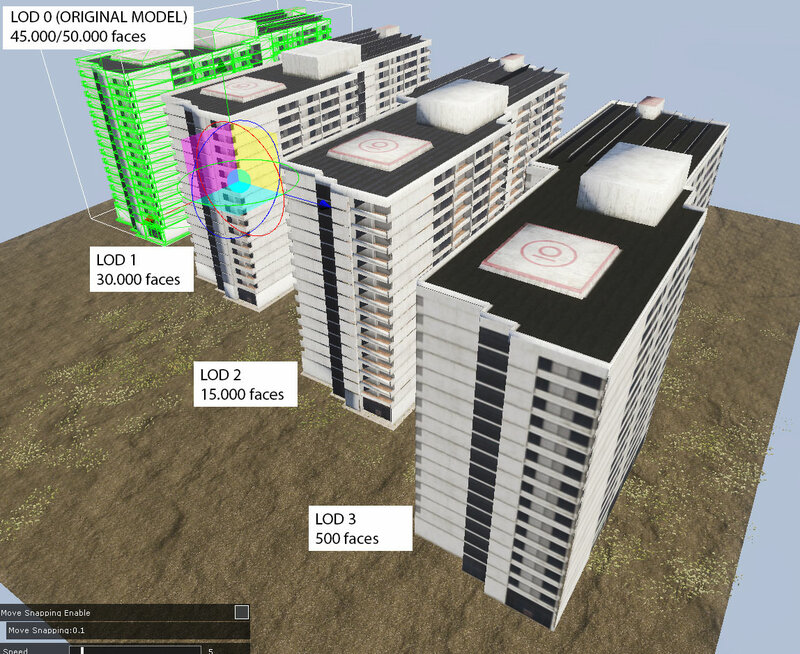 This model is now 5-6 times more optimized than before without changing any of the overall look of the building. Optimized one of the huge skyscraper buildings. (Used in for example "Rio" in the new Oregon map). Also added LODs. Fixed an issue with the cali gas station building where there was some faces missing in the model. Fixed a physics related to one of the trees used in Rio in the Oregon map. The leaves had physics, and now only the tree branches have physics. Fixed various issues with one of the smaller open norad office buildings. (The one with the solar panels on top) Optimized original model and fixed some texture issues. Major improvements have been made to the vehicles system and the vehicles overall. Vehicles should overall work better and more smooth now and are way more stable than before. We are still aiming to make improvements and there will still be some stats for certain vehicles that can be updated and improved so make sure to let us know your feedback so that we can work on this! Fixed a bug where the camera would get glitched as a car passenger. We have finished the development and major testing of FAC 2.0. Most of you should expect a boost in FPS, stability and a decrease of the already super-low percentage of 'cheaters'. If you have any problems with this, please make a support ticket. We will be dedicating a lot of time to making sure this is not going to be a problem for everybody, but a improvement instead. There has been other optimizations too, many of the engine's features have been moved to using multi-threading, giving computers with high amount of CPU cores a bigger boost. Added a new media riot shield: Riot Shield Nozze. Added a new variant of the stanag mag. The: "Stanag E-Mag". This magazine is a stanag mag with 200 bullets. To make this ammo box not too overpowered it gives a weapon 20% more spread and recoil when using it. (double as much as for the Stanag C-Mag). We are not sure yet what the rarity of this new ammo will be etc. as it can't be too common to "break" the game so give us some time to decide this. Increased the fire rate and damage of the FN Scar H based on community feedback. Increased the fire rate and damage of the VSS Compact based on community feedback. Increased the fire rate from 120 to 200 of the FN Fal. Updated the fire mode of the FN Fal. This weapon can now also has a automatic and triple burst fire mode. Fixed an issue with the Witch Hat where the texture wasn't working properly. Fixed / improved the Lunaa hat. The character's head is no longer clipping through the back side of the model. Fixed the angle of the Hunter Backpack store icon. Mirrored the icons horizontally so that it matches the angle of the other backpacks. Also updated skin icons. Fixed the sound cutoff of the TEC 9 shooting sound. For some reason there was too much "bass" with this pistol shooting. Optimized the original FPS and TPS models of the Tactical Binoculars. This model was very unoptimized and potentially causing FPS drops and crashes. The model has been optimized from 24k to 3k. Did major FPS / Performance improvement related to the SVU skins. Some of the skins were extremely unoptimized. Fixed an issue with the M4A1 where the iron sight was flying. This sight is no longer flying. Fixed the M4A1 TPS model. Now also has the clip / sight attached. Fixed the VSS Compact icon and removed the silencer from the icon. The icon now matches the weapon in-game. Removed the "silenced" barrel from the FN Scar H. Since this weapon wasn't silenced it didn't make sense to have this huge barrel attached. Also updated the store icon of the weapon to match it again. Updated the icon of the Stanag C-Mag. Updated the model and icon of the G36 C-Mag. We have reworked the model of the magazine so that it's not a blatant copy of the Stanag C-Mag. Now, it actually has it's own recognizable G36 bullet clip instead of the stanag one. The AK-12 has finally been reworked. We have also renamed this weapon to AK-15 based on the ammo type it's using. Statistics are updated too and this weapon is able to use all attachments. It's also spawning everywhere again. The M200 has been reworked. The main reason this weapon needed to be reworked was to optimize it. Also, we weren't happy with the look of the weapon. New model is 6x more optimized and looks better. In the meanwhile we have also reworked the firing sound and on top of that a new scope (M200 now uses it's own custom scope) has also been added with a custom sight. Also, the skins for this weapon have been reworked and updated to the new model: M200 Chrome, M200 Christmas and M200 Destruction. The AS VAL has been reworked. This weapon has been reworked mainly due to optimizations, also it now has a overall better looking model. Iron sight / sight animations have been improved and we have also updated the stats. In patch 2.18 this weapon was a little bit nerfed and based on you guy's reports we have updated / buffed the statistics of this weapon again. The AMR2 has been reworked. Pretty much the only thing that is changed here is that the mesh is 20 times more optimized. Old model had around 80.000 faces and the new one only has 2-3.000! This is very good for FPS and performance improvements where this weapon was SUPER unoptimized. (Example of the improvements: https://i.imgur.com/LecLhk7.png) Also skinned version meshes have been updated! The STI Eagle has been reworked. This mostly because it's been using the "Jericho" model since for ever. It was relatively easy / short to replace this model so we were like; "Why not?". Also reworked / updated the icon. The DMR Ammo has been reworked where we have changed the magazine to a new model to mainly match the FN FAL rework. It has also been optimized A LOT. The FN FAL has been reworked. This weapon was the last weapon that needed a rework because of optimization reasons. Major improvements have been done and we have worked with an entire new model with new textures. Optimized the TPS model of the M200 and it's skins. Optimized the TPS and the FPS model of the Light Swords Twin and it's colored skins. Optimized the TPS and the FPS model of the Light Swords Cross and it's colored skins. Optimized the TPS model of the PKM and it's skins. Optimized the TPS model of the M16 and it's skins. Optimized the TPS model of the Thompson and it's skins. Optimized the TPS model of the M107 and it's skins. Optimized the TPS model of the Airdrop Caller GC and GD. Optimized the TPS model of the SVD and it's skins. Optimized the Hunter Backpack and it's skins. Optimized the Heavy Armor Fallen Angel and it's skins. Optimized the Climber Character and it's skins. Optimized the Average Jane Character and it's skins. You see above where we optimized a lot of weapons and other items. A lot of TPS (Third Person) items weren't optimized AT ALL. TPS models get used when an item is for example dropped on the ground. Basically, the more dropped on the ground in a server, the less FPS a player can have and when TPS models dropped are very unoptimized this becomes a huge FPS killer. Imagine going to the airport and loading all that unoptimized TPS loot.. The list you see above will not contain everything that was unoptimized in the game because this would simply be too much work to do at once, but the list is based on priority where the most unoptimized items are optimized first. We will keep working on this over time. Added a new skin for the Community Box: Custom Guerilla Fallen Angel Purple. Added a new skin for the Community Box (probably): Thompson Purple. For all new skins added to the game it doesn't mean they will be instantly available. For updates regarding this please keep an eye on our social media where we announce the release of new skins. Fixed an issue with the Moto Helmet Krissy skin where there was the wrong glow map texture used. Fixed the legs of the Average Jane Alien skin. Improved the Tactical Weapon Case loot. Removed the Stanag C-Mag / AK Drum from the box since it's only obtainable from Super Zombies / Alien Super Zombies. Only rare items are in the crate now. Increased the revive sound volume in PVP Servers. (The sound we added in the hotfix when another player spawns in) Players could literally not hear this sound when being in PVP. We higher-ed it and will await and see how it is now. Improved the minimap: reduced the blue colors of the waters. Made it less bright to make it look better. Loot is fixed! Loot was completely broken and not how it was intended to be. If you've played Oregon in the past, please try again because the loot is completely changed. Players are now able to rent this map as private server in Open World. Fixed a player spawn at the Harbor where players were spawning inside / under the terrain. Fixed some overall terrain issues and settings. Fixed some overall flying objects generally around the entire map. Fixed the "Fredaikis container" which is placed pretty much round the entire map. It didn't had correct physics. Fixed an issue related to the render distance of the terrain and hills. Fixed some flying placed down vehicles in Frosty Pines. Fixed some flying trees around Devil's Pass. Fixed some miss-placed signs around the airport. Fixed some terrain issues around the football stadium. Improved the overall shadow quality for players that are playing on ultra on this map. Fixed some rocks around the school building that didn't had physics. Fixed some miss-placed objects in Clearview. Removed the airport tower from this map since it was a way too overpowered spot for players and it was getting abused pretty much all the time. The super zombies now have a chance of dropping a super zombie head. This item is very rare and until (for) now you can't do more with it than just collect them. The goal is to in the end create a special progress based melee that has these heads spiced up. Basically, a collectible item farmers can collect and upgrade with the crafting system where in the end it will be a super cool, rare and valuable melee with a lot of super zombie heads spiced up. Stay tuned for this! Opened some of the fences at the prison. Added some metal walls around the airport tower at the prison to make it less camper friendly. Added some car spawns around the newly added area's. Fixed some flying objects in and around the prison. Oregon is now available as Official Server map in this game mode. Players are now also able to rent Oregon private servers in Survival. Oregon does have reworked loot so expect some change not just in the map but also the loot. Loot should overall be better, make more sense and at the same time still have the same values of the "Survival idea". Please give us as much feedback as you can about this as we don't expect everything to be perfect at first try. Oregon now has alien super zombies. This means that for the first time in Survival we are releasing alien super zombies. The spawn parameters are the same as in Open World, aka it only spawns in the night. This alien super zombie drops overall better loot than the normal super zombie and it has a higher chance of dropping a sniper. NOTE: Changes are planned to happen to old Colorado Survival as well as this map will still be available. This means we do plan on adding alien super zombies / loot improvements in this map very soon as well. NOTE 2: Depending on how the newer / reworked weapons are received by the community we might consider releasing them at a later moment in the Survival game mode as well. NOTE 3: For all those Survival players out there: Please keep up the amazing feedback. We plan on using and processing as much as possible to improve the Survival game mode as much / good as possible! add an old map of the arena BATTLE ROYAL!!! OMGGGGGGGGGGGGG Awsome Patch I Like It!! What do you think about the Survival Notes? Great Patch Boss, my dream is remove MACROS in game, MY DREAM. CAN IT BE FOUND EASY? OH BABYYYYY LETSSS GOOOO BOISSSSSSS !!!!!!!!!!!!!!!!!!!!!!!!!!!!!!!!!!!!!!!!!!!!!! Can't wait!! why not add character Shine? TheRenegadeMarine- Will the FALbe re-classified as an AR instead of a DMR? (due to the fact that it can be full auto). Can there be a few more Bus stops near places of the flags in the Oregon map. Sometimes the flag will stop becoming vulnerable as soon as i reach the area which makes me have to run back to the bus stop. http://prntscr.com/k5p4pv . Every 5-7k there should be higher rank so people can actually fight for something, that would also make pvp more intense. Getting even warmonger in survival is super hard. Also, i would like to see some kind of missions in survival. There was even a tab for it in the game. Thats the simplest way to entertain players. With new map you could create something like that - for example: kill 100 zombies to get X. Kill 30 players to get X. Collect X items to get X. Visit X cities to unlock/get X. I don't think thats any hard to implement.